Now that the weather is (sometimes) warm enough to bare my wrists and arms while wearing a tee shirt, I’ve been really into stacking dainty bracelets. I’ve enjoyed experimenting with different stacks and while I’m no master, I like to have fun with it. But as I was looking for some dainty bracelets to add to my collection, I realized I am fairly boring when it comes to my stacking game. Most of what I own is gold chains or bangles. So I’ve made it my goal to mix up colors, textures, and metals to make a more interesting stack. I’ve got to diversify my portfolio, right? I have picked out two similar, stackable bracelets at different price points that are socially conscious and will add a little pop of color to your wrist. Stylistically speaking these two bracelets are extremely similar. Both have a colorful, adjustable band with a metal bar centered in the middle. The materials and prices are what set these two apart. 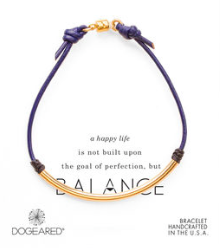 The first and more expensive bracelet is from Dogeared, which you can buy here. The founder of Dogeared, Marcia Maizel-Clarke, believes jewelry could be both beautiful and meaningful. All of the jewelry is designed and hand crafted in the spirit of love, kindness, and consciousness out of their Southern California Studio. Dogeared is a certified B Corporation. Don’t know what a B Corporation is? Check out this video (it probably explains it better than I can). Basically, they’re all about creating, implementing, and sustaining ethical business practices. Dogeared adheres to these standards by handcrafting everything locally, respecting the planet, and partnering with non-profit organizations that share their vision of a better world. While this bracelet won’t completely break the bank at $42, it is over twice as much as the other bracelet I’ve picked out. The next bracelet is by Pura Vida and can be purchased here. It is very similar to the Dogeared bracelet, but instead of leather, the band is made with string and only costs $15. The company started after the founders, Griffin Thall and Paul Goodman, took a trip to Costa Rica and fell in love with the pura vida (pure life) lifestyle. They met two men who were selling bracelets on the street and decided to take some of the jewelry back to sell in the U.S. The bracelets became very popular and blossomed into a business. Today Pura Vida provides jobs for artisans in Costa Rica. They also created the Charity Collection which gives back to charities all over the world through the sale of individual bracelets. The bracelet I have featured today gives $3 to Boarding for Breast Cancer. So which do you chose? Will you splurge or save? Categories: Uncategorized | Tags: Boarding For Breast Cancer, Bracelets, Breast Cancer, Charity, Costa Rica, Dogeared, Ethical Business, fashion, Jewelry, Life, Lifestyle, Pura Vida, Socially Conscious | Permalink.